Exeter City boss Matt Taylor is looking forward to his misfiring team getting back on the road when they head to the PTS Academy Stadium to take on the Cobblers on Saturday (ko 2pm). The Grecians’ promotion bid has stuttered in recent weeks, and last weekend they were beaten 1-0 at home by Tranmere Rovers, and they were also beaten by Bury by the same scoreline in their previous clash at St James Park. On the road though it has all been more encouraging, with Exeter winning 2-1 at Crewe and only being denied a victory at leaders Lincoln City by a last-gasp equaliser in a 1-1 draw. That three-pointer at Crewe is the Grecians’ only win in their past five games, and with the chasing pack closing in, Taylor knows his team have to start winning again if they are to maintain their place in the top seven. And he is hoping to do just that at the home of the Cobblers. “Off the back of the Crewe victory, and coming so close at Lincoln, we’ve been playing really well away from home,” said Taylor. “It seems to have suited us to a certain extent, soaking up a bit of pressure and then hitting teams on the counter attack, but also the good surfaces we’ve played on away from home. “Northampton will hopefully be the same, but it’s all about the points at this stage of the season. The problem for Exeter is that they will come up against a Cobblers team in good shape at the moment, and one that has lost just once at home in the league since early September. Taylor believes Town’s current 16th position in league two is something of a false one for a squad containing ‘some seriously good players’, and he is preparing his team for a difficult afternoon at the PTS. “We know how tough it will be at Northampton, they’re a team in form, but away from home we’ve been playing well,” said the Exeter boss. 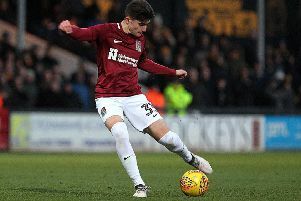 “Northampton have got some good players, a team that we watched a lot at the start of the season, and they were underachieving because they have some seriously good players in that squad. “They’re hitting form at the right time and the manager has got them going, so they’re a good team, a strong team and a physical team who will put a lot of balls into our box. Exeter have also struggled with injuries and will arrive in Northampton without a fit centre forward. Top scorer Jayden Stockley was sold to Preston in January, and Taylor has a major headache as forwards Jonathan Forte (knee), Ryan Bowman (groin), Donovan Wilson (groin) and Lee Martin (calf) are all sidelined. “It’s incredible and you can’t foresee it happening,” said Taylor. “Donovan and Ryan are new to the club, they only arrived in January, so we haven’t had time to work on them physically. “We might have to tinker with how we play slightly, knowing what we have at the top end of the pitch.